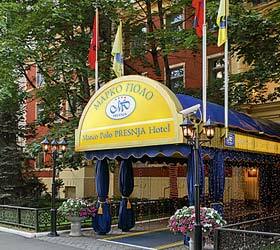 The Marco Polo Presnja Hotel is a comfortable four-star boutique-style hotel located in the most quiet and legendary place of historical part of Moscow near the Patriarshie prudi (ponds), close to main places of interest, business centres and embassies. The hotel offers accommodation in 70 comfortable rooms including 16 suites, which windows overlook the narrow small streets storing special charm of old Moscow. The hotel has a delightful lobby-bar, summer terrace cafe and 2 cozy restaurants offering international cuisine. There is a business centre, health club, 24-hour room service and reception with very friendly staff, providing most personalized service. The hotel provides conference facilities for up to 150 pax and a meeting room for 12 pax are available. All guestrooms and floor interiors are appropriately equipped to make guests feel at home while away from home.